Work ongoing to highlight women’s history sites nationwide…PLUS news! The city of New York’s public art initiative will commission artworks honoring women’s history. The mayor and the Department of Cultural Affairs, has committed up to $10 million over the next four years to fund new permanent public monuments and other works.The “She Built NYC” initiative kicked off on June 20 with a call for nominations of women or historical events that significantly impacted New York City. Members of the public made nearly 2,000 suggestions. The city will narrow the list to five finalists for commemoration. An advisory panel will help match the women, group of women, or event to a public site. The Alice Paul Institute in New Jersey is celebrating Women’s Equality Day by hosting “A Night in Suffrage White” on Saturday, August 25, 2018— a day before the holiday commemorating the passage of the 19th Amendment. Attendees are asked to wear all-white in honor of the suffragists. The event, which started in 2017, is BYO everything, from tables to chairs to dinner. The cost to attend will go to girls’ leadership programs at API. Tickets are $20 per person but can only be purchased in groups of four, six, eight, 10 or 12, so gather friends together to celebrate 98 years of US women having the right to vote.The pop-up dinner will be held at Paulsdale, in New Jersey, a National Historic Landmark that was the home of Alice Paul, a major leader in the women’s suffrage movement. The Alice Paul Institute at Paulsdale is located at 128 Hooten Road, Mount Laurel, New Jersey. August 26th is Women’s Equality Day. As 2020 and the national women’s suffrage centennial approaches, there is more interest than ever in those on the ground who witnessed and participated in this fascinating part of history. Find out what Marguerite Kearns has to say about growing up as the descendant of suffrage activists—Edna Buckman Kearns and Wilmer Kearns, her grandparents. Follow Marguerite on Suffrage Wagon News Channel that has been publishing since 2009. Zoe Nicholson is celebrating her 70th birthday and she’s hearing the call of the wild. Give her a visit at MissAlicePaul.com The above clip from her email message urges friends to visit the SuffrageCentennials.com web site. We’re rooting for the terrific work Zoe has been doing with her theatrical piece about suffrage activist Alice Paul. The National Collaborative for Women’s History Sites (NCWHS) invites new members. Founded in 2001, NCWHS supports and promotes the preservation and interpretation of sites and locales that bear witness to women’s participation in American life. MEMBER BENEFITS—Women’s Sites are the focus! Receive a copy of the published guides: Women’s History: Sites and Resources and Revealing Women’s History: Best Practices at Historic Sites. Participate in the online member directory, viewable only by members and includes name, site and email contact information. Access new member services as they are developed, including members-only content and a members’ forum. Showcase your work on our website. We regularly post news from member sites on our homepage and on social media, and welcome news and contributions from members. Enjoy exclusive access to NCWHS webinars and online workshops and other professional development opportunities to learn more about doing women’s history at historic sites. Attend the NCWHS annual member meeting, held either online or in conjunction with a national conference in a related field. Present your research at sessions NCWHS organizes at the American Association for State and Local History (AASLH), National Council on Public History (NCPH), Berkshire Conference of Women Historians, the Organization of American Historians (OAH), and other national and regional conferences. Become an active part of a national network of individuals, organizations and sites that share resources and promote the cause and each other. NCWHS is a 501(c)3 non-profit organization. Your membership and any other gift is tax deductible to the extent allowable by law. This entry was posted on August 24, 2018, in Blog and tagged Marguerite Kearns, National Collaborative for Women's History Sites, women's history. 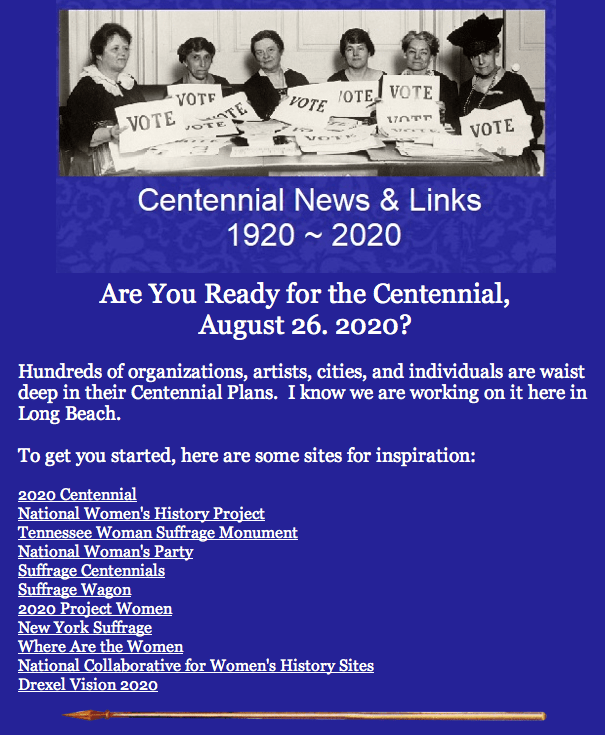 Get ready to celebrate 2020, the US suffrage centennial, PLUS news! Women’s Suffrage Movement Photographs from the Library of Congress on Vimeo. The woman’s suffrage photo collection at the Library of Congress is fascinating and is by no means the entire collection. Consider it a beginning or a refresher. And keep your eye on the prize: suffrage movement events and celebrations from now through 2020, the nation’s big celebration, the centennial of all centennials. 2020 marks the 100th anniversary of women’s suffrage. In honor of the Centennial and the fight for women’s equality, the NWP is renewing its work to achieve full constitutional equality for women. It will change its name officially in the near future. The National Woman’s Party hosted US Supreme Court Justice Ruth Bader Ginsberg on August 26th, Women’s Equality Day, at the Belmont-Paul Women’s Equality National Monument on Capitol Hill in Washington, DC. The event was moderated by Jill C. Morrison of Georgetown Law on why the Equal Rights Amendment to the US Constitution is critically important. Link for Library of Congress photo and prints collection. Terrific suffrage collections and educational programs are available from “American Memory,” under Women’s History, including: An American Time Capsule: Three Centuries of Broadsides and Other Printed Ephemera; Words and Deeds in American History: Selected Documents Celebrating the Manuscript Division’s First 100 Years; Votes for Women: Selections from the National American Woman Suffrage Association Collection, 1848-1921; Miller NAWSA Suffrage Scrapbooks, 1897-1911; and American Women: A Gateway to Library of Congress Resources for the Study of Women’s History and Culture in the United States. Our sister women’s rights history sites offer different angles on the first wave of the women’s rights movement in the US. SuffrageCentennials.com focuses on events, celebrations and programs. LetsRockTheCradle.com specializes in feature articles, action campaigns, and news. Suffrage Wagon News Channel has been supporting the exhibit of the “Spirit of 1776” suffrage campaign wagon used by Edna Kearns in New York City and on Long Island. Marguerite Kearns is the granddaughter of Edna Kearns and a freelance writer on women’s history. This entry was posted on August 15, 2018, in Blog and tagged 2020 suffrage centennial, Library of Congress, Marguerite Kearns. New York Times puts suffrage activist Inez Milholland on its statue list! Plus suffrage centennial news & events! A book baking in the oven about suffrage activists Edna and Wilmer Kearns! from Marguerite Kearns on Vimeo. A New York Times article published on July 27, 2018 included suffrage activist Inez Milholland on a list of ten suggestions for New York City to add to its recommended “to do” list when the erection of statues are under consideration. The article, “More Women Deserve Statues in New York. Here are 10” A previous article asked newspaper readers to send in suggestions. Inez Milholland was number three on the published list. 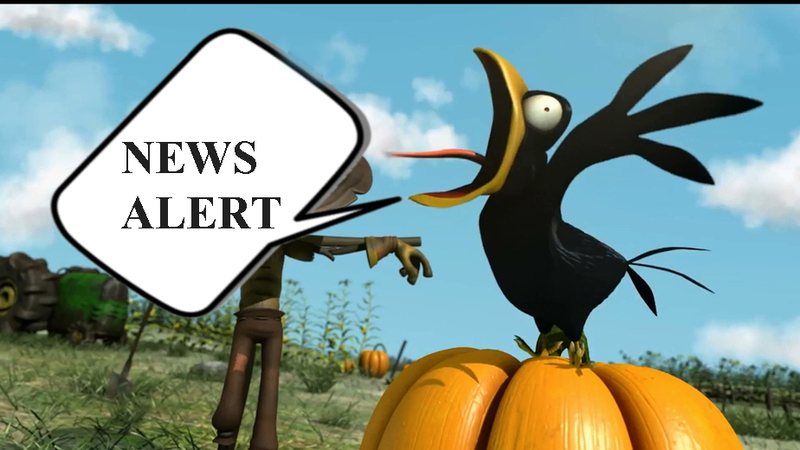 The news is coming in from around the nation. The year 2020 is on the planning agendas of numerous organizations. Take New England for example where events are popping up with 2020 in mind. The documentary “Equal Means Equal” is one choice for organizations to present at fundraisers and special events, especially August 26th, Women’s Equality Day. See the film’s web site for information about arranging for a screening. The National Women’s History Project has a terrific publication highlighting how US women won the right to vote. It’s a great resource to hand out on August 26. See nwhp.org for ordering information. Publishing the story about my grandparents, Edna and Wilmer Kearns, had to come some time, and it has been in the pipeline for a while. Of course there are distractions and side trips and research. But the goal has been 2020, and this is a message from the mountain about why it’s difficult on occasion to contact me. I’m running here and there, but sooner or later I’m back on track again. Part of the reason for the diversions has to do with keeping up to date with suffrage centennials, news, events, conferences, and special occasions. A blog takes a lot of work, but it has grounded me in the grassroots. Last year, 2017, had me stepping—the year of the 100th anniversary of women voting in New York State and very exciting for me with the exhibition of the “Spirit of 1776” suffrage wagon used in grassroots organizing campaigns in New York City and Long Island during 1913. The New York State Museum did a fabulous job in the exhibition, “Votes for Women,” that opened in November 2017 and closed in May 2018. What a thrill to walk into the state museum in Albany, NY and see the wagon there, up front in the museum lobby. SuffrageCentennials.com is a multi-media platform and clearing house for information, announcements, and features about local, state, national, and international suffrage celebrations, programs, performances, events, news and views. Regular postings, plus video and audio highlights. The National Federation of Press Women honored SuffrageCentennials.com in 2015 with a national media award. This entry was posted on July 28, 2018, in Blog and tagged 2020 suffrage centennial, Edna Kearns, Marguerite Kearns, Wilmer Kearns. Great suffrage centennial celebrations, New York State! Suffrage Wagon Cafe loved the New York State suffrage centennial from 2017 to 2018!! on Vimeo. Thank you, New York State Museum, for your terrific votes for women exhibition. There were so many events and special celebrations during 2017 and 2018, we couldn’t keep up with it all. If you weren’t featured on the suffrage centennials blog, contact Marguerite Kearns at SuffrageWagon at gmail dot com. Let us know what you are doing, and if we can feature your hard work, we will. This entry was posted on May 30, 2018, in Blog and tagged Marguerite Kearns, New York State Museum, suffrage centennials. 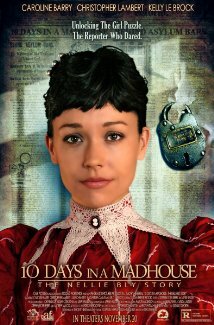 Marguerite Kearns spoke to Susan Goforth and Timothy Hines about the film, “10 Days in a Madhouse” that’s based on the investigative reporting of Nellie Bly. Listen by following the link. Check in with the special program at Suffrage Wagon Cafe on November 8, 2015 about “10 Days in a Madhouse”, a production about trailblazing reporter Nellie Bly. “10 Days in a Madhouse” is based on a true story about Nellie, a suffrage activist and trailblazing investigative reporter who went undercover in a mental hospital before the turn of the 20th century. Nellie’s discoveries shocked the nation. The production features more than 90% women. Two contests: Turning Point Suffragist Memorial as well as unique opportunity from Womenon20s.org: “Name The People on The Other Side” (see above image): No cost to enter the contest. Submit the names of the 12 people featured on The Other Side on the form provided on the Womenon20s.org website. Essay Contest: Tell in 500-1000 words why commemorating women on currency is meaningful. All entries will be sent as one package to the U.S. Treasury and U.S. President. Submitters will be eligible to receive a limited edition commemorative coin tribute and Final Four poster. Send entries to: women@womenon20s.org. Turning Point Suffragist Memorial has an essay contest for undergraduate and graduate students across the nation. This entry was posted on December 4, 2015, in Blog and tagged 10 Days in a Madhouse, Marguerite Kearns, Nellie Bly, Suffrage Wagon Cafe.